The European Aviation Safety Agency (EASA) has issued their analysis of the main safety risks involving Unmanned Aircraft Systems (UAS) / Remotely Piloted Air Systems (RPAS) / Drone operations. The aim of the study was to better understand the safety risks posed by the growing use of UAS. The study used occurrence data from both the European Central Repository (occurrences reported to NAAs of the EASA Member States) from 2010 to May 2016 and also from airlines involved in EASA’s Commercial Air Transport (CAT) Aeroplanes Collaborative Analysis Group (CAG). EASA note an “increasing trend” of reports and a “clear and significant jump in 2014″. 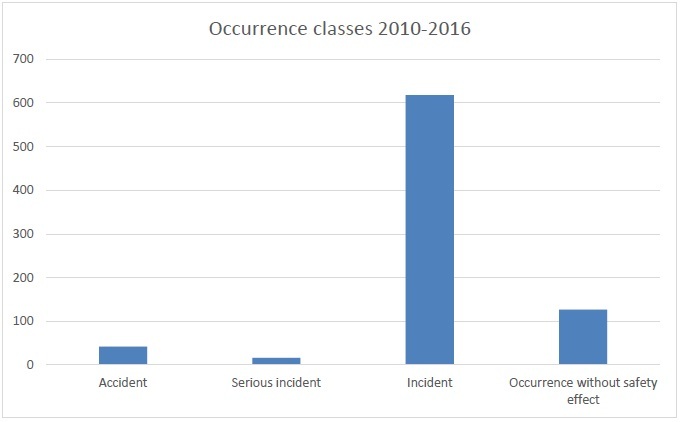 From these occurrences there were 42 accidents, the majority of which resulted from the crash of drone for either technical reasons or due to loss of control. None of these occurrences involved fatalities or injuries. The first stage in the development of the Safety Risk Portfolio involves the identification of the Key Risk Areas (Outcomes) that derive from the Occurrence Categories in the ECCAIRS Taxonomy. From the most common outcomes the Key Risk Areas can be identified (though some Occurrence Categories are not outcomes and so are disregarded). EASA do note also that “Some of the Key Risk Areas are interlinked and may give rise to another outcome”. Aircraft Upset. This covers the full range of Loss of Control situations, which presents the potential for injuries to people on the ground. System Failures: These are included in the Key Areas as they could also lead to injuries to people on the ground, especially in certain types of UAS operation. Third Party Conflict: This covers the risk of collision with people or property (i.e. not aircraft) that may cause injuries or damage. Expert judgement identified this as a key risk area that could occur through causes not associated with loss of control (Aircraft Upset) or technical failure in situations where a drone operator accidentally flies into people or property. The second part of analysis for the development of the Safety Risk Portfolio involves the identification of the Safety Issues that are associated with the different Key Risk Areas. Normally, this would involve a mainly quantitative analysis however due to the lack of detail in some of the UAS data, the analysis of Event Types can only provide some indications on possible Safety Issues. Detection, Recognition and Recovery of Deviation from Normal Operations. 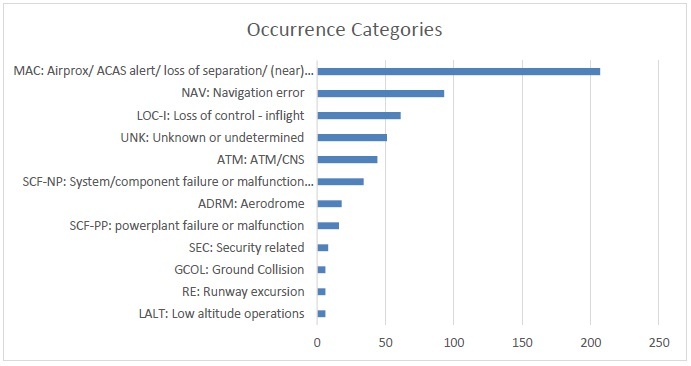 The Safety Issue found most frequently in terms of accidents is related to the Key Risk Area of Aircraft Upset. It specifically relates to the operators’ ability to recognise and recover from abnormal aircraft attitudes. UAS Handling and Flight Path Management. This Safety Issues is related to both Airborne Conflict and Aircraft Upset, as well as Third Party Conflict. It relates to both the normal handling of an RPAS and the planning and management of the flight path. There is also a relationship to the planning and preparation of RPAS operations. UAS Infringement of Controlled Airspace/ UAS Proximity to Other Aircraft in Uncontrolled Airspace. This involves the risk of a UAS either infringing controlled airspace or presenting a collision risk to other aircraft in uncontrolled airspace. Work to investigating the potential benefits of Geo-Fencing to prevent UAS flying into controlled airspace is already taking place. This Safety Issue is also linked to the Human Factors (HF) Safety Issues on UAS Operator Knowledge of the Aviation System. Technical Safety Issues. Three technical Safety Issues have been identified from the analysis of occurrences and covers the failures of the guidance and control system, propulsion system and power sources. Pre-Flight Planning and Preparation. The first HF Safety Issue for UAS involves the need for good pre-flight planning and preparation so that an UAS operator conducts any flight in a safe manner. As UAS operations involve many people that are unfamiliar with the aviation system, safety promotion will be important to make operators aware of good practices that they can easily follow. UAS Operator Knowledge of the Aviation System. The second HF priority area is to ensure that anyone operating UAS who is new to aviation is able to easily learn about the aviation regulatory framework as it applies to UAS operations. Maintenance/ Manufacturing. The final Safety Issue is related to the maintenance and manufacturing of UAS and further analysis work is required to consider this issue in more detail as minimal information was available from the analysis. Instructions for Use of UAS equipment (“It has been identified by UAS users that the User Manuals provided by UAS manufacturers are not up the standard they need to be”). Recommendation 1: The Task Force recommends that an analytical model of the drone threat should be developed that takes into account a more detailed analysis of the construction of drones and an assessment of the dynamic behaviour of drones and their components, (in particular their motors and batteries,) during an impact. To gain confidence in the model, the method should be validated against laboratory tests, in particular to validate the behaviour of specific drone components such as the batteries or the motors during an impact and to confirm the prediction of the overall frangibility of the drone. This validated analytical model could be used for further impact analysis (see Recommendation 3). Recommendation 2: The Task Force recommends that a specific risk assessment should be conducted to assess the behaviour of lithium batteries on impact with structures and rotating parts, and their possible ingestion by jet engines. The assessment should, if possible, be supported by testing, and should address the risks of explosion, fire and air contamination. Recommendation 3: The Task Force recommends that further research should be conducted to establish hazard severity thresholds for collisions between drones and manned aircraft. Impact analyses should be performed to determine the effects of a drone threat (as established per Recommendation 1) impacting aircraft critical components, possibly capitalising on existing computing and software capabilities and other particular risk assessments such as those for bird, tyre and engine debris impacts. To gain confidence in the model, the method should be validated against tests on representative aircraft components such as airframe parts, windshields and rotating elements (i.e. rotors, propellers and fan blades). Geo-limitation solutions cannot be expected prevent malevolent behaviour, a rationale that applies to many of the Task Force recommendations. Thus, the Task Force focused on the prevention of the unintentional breach of limits. Provision to UAS operators of up to date, accurate and easily understandable information that helps them to determine restrictions or requirements in effect at the location where they want to operate. This information could be more easily provided to UAS operators by integrating it into the remote pilot station or make it accessible through a standalone mobile application. UAS performance limitations, including height or altitude limitation and range (horizontal distance to the remote pilot station or to the take-off point) limitation. The Task Force favoured height limitation as the main performance limitation that can effectively contribute to mitigate the risk of collision not only in the vicinity of aerodromes. Requirement for UAS designs to include built-in features that warn the remote pilot when the unmanned aircraft is starting up in, or approaching to, a zone subject to UAS restrictions. Requirement for UAS to incorporate geo-fencing, which requires position-sensing and control functions, sufficient to comply with any restrictions on where and when a UAS might operate. To respect these geo-limitations through the use of automatic functions (i.e. geo-fencing, performance limitation functions) and, at the same time, allow the removal of such limitations for authorised operators, the Task Force identified the need to define “hardlocked” and “soft-locked” geo-limitations and the corresponding un-locking processes. When regulating the use of such automatic functions the Task Force noted the need to keep rules technology-neutral and to provide the UAS manufacturing industry with appropriate scope to generate solutions and to propose any necessary technology standards. Besides, product requirements and standards must be applicable to UAS operating in Europe, and not just those produced by European manufacturers. With regard to mandating a retrofit of these automatic functions to the existing UAS fleet, the Task Force concluded that, considering the relatively short average lifetime of UAS products and difficulties (or impossibility) of implementation, retrofitting should not be mandated and, instead, further operational limitations should be considered where appropriate. For homebuilt UAS, the Task Force concluded that requirements similar to those for consumer-retailed UAS should apply in terms of, at least, pilot competencies, registration and electronic identification. Similarly, the COTS guidance navigation control components of homebuilt UAS should be subject to the product requirements applicable to UAS that are subject to geo-limitation function requirements. Regarding industry standards, the Task Force identified a number of “geo-limitation” related aspects as candidates. The Task Force identified EUROCAE as the organisation best suited to lead the European effort to develop standards working in coordination with ESOs and other industry standard bodies. 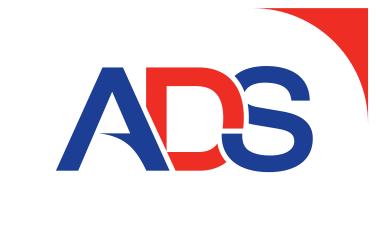 Any standards must be a good fit to the characteristics of the small UAS business and be able to achieve tangible results that can be implemented by the small UAS industry in the short timeframe that this particular business segment requires. The Task Force sees JARUS as the right forum to drive these activities forward on the regulatory side. 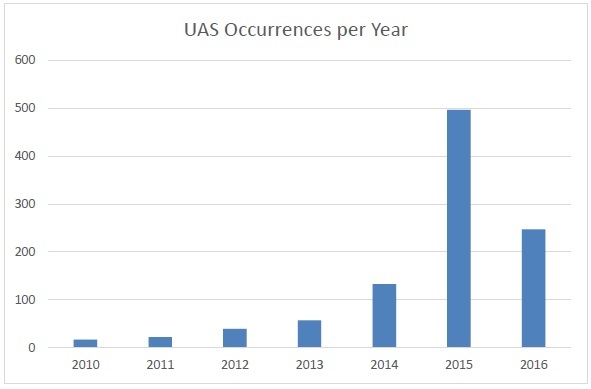 This is because JARUS has gathered together a significant number of national aviation authorities and other relevant organisations, has been working for some years on regulatory material for Light UAS, and now includes representatives of stakeholders directly involved in the segment of small UAS and in the operations that are more likely to be affected by “geo-limitations”. EASA has recently produce a ‘Prototype’ regulation for the ‘open’ and ‘specific’ drone categories. This ‘Prototype’ regulation proposes actual rules providing the necessary clarity, notably on what are the responsibilities of the Member States and what is the flexibility offered to them. It has been called ‘Prototype’ to reflect the fact that they should help preparing the formal rulemaking process that will follow. The ‘Prototype’ regulation is supplemented by an Explanatory Note that provides the rational and background for the text. The intention is to gather feedback which will be used to develop a Notice of Proposed Amendment in 2017. The report finds the number of encounters is increasing. While there have been no reported collisions between RPAS and manned aircraft in Australia, and given the variables, the potential consequences of collisions are not yet fully understood. About half of the 180 occurrences from 2012 to 2016 involved proximity encounters with manned aircraft. Over 60 per cent of all reported RPAS encounters (108 occurrences) occurred in 2016 (69 occurrences).